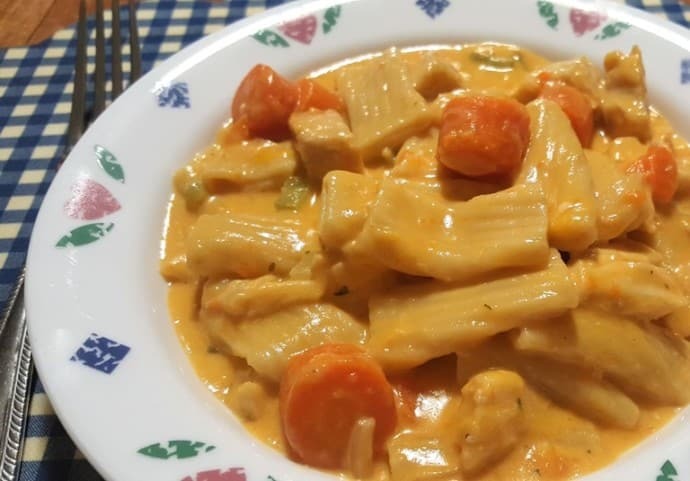 Instant Pot Buffalo Chicken Macaroni and Cheese is a surprisingly delicious ‘adult’ macaroni and cheese, with a slight kick and made with White Meat Chicken, Carrots and Rigatoni Pasta. Instant Pot Crack Buffalo Chicken Mac & Cheese. 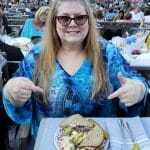 My husband and I love this dish! 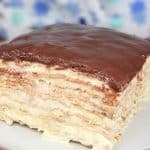 It seems to get better with each bite and tastes even better the next day. 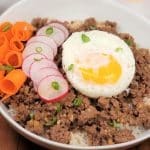 It’s a quick meal to make when you have nothing planned for dinner. 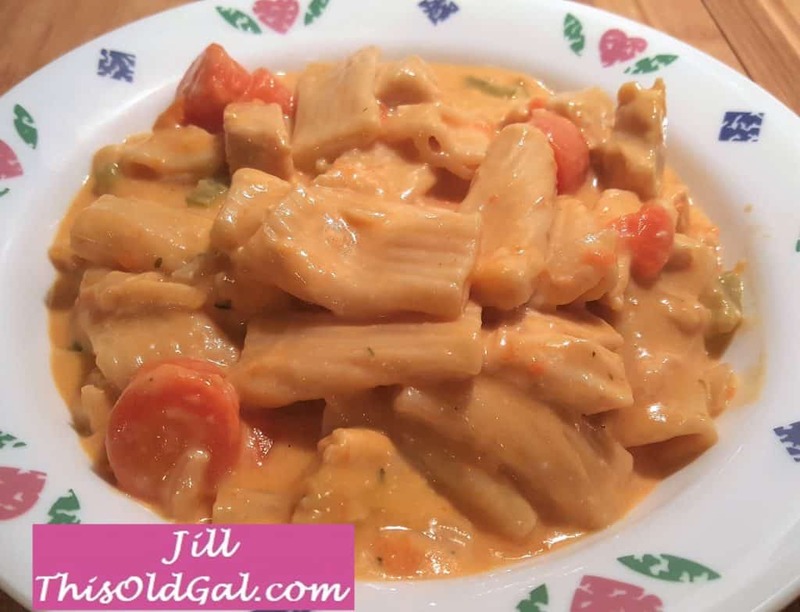 Pressure Cooker Buffalo Chicken Macaroni and Cheese a/k/a/ Instant Pot Crack Buffalo Chicken Mac & Cheese, is an ‘adult’ macaroni and cheese, quickly made in your Instant Pot or Pressure Cooker. It is surprisingly delicious. After a couple of bites, suddenly, you are hooked and will yearn for more and more. Seriously. If you don’t want spicy, no worries, in the notes section, I tell you how to make it mild. The recipe is written for medium, so it’s not too spicy as written. I saw Wolfgang Puck and Deb Murray make this on TV around 2004, and it sounded interesting, so I decided to use the recipe. I made several changes, to suit my taste buds and preferences. I couldn’t believe how delicious this tasted. 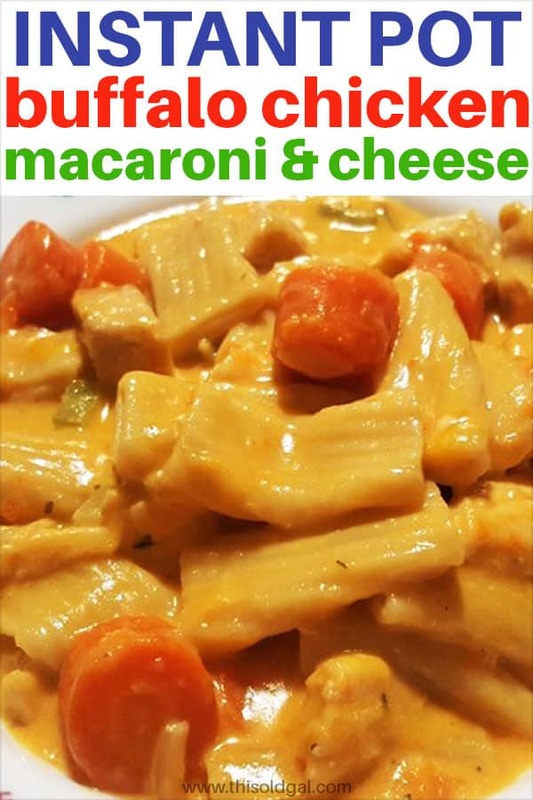 What are the Ingredients to Buffalo Chicken Macaroni and Cheese? Hidden Valley Original Ranch DRY Seasoning – don’t let this stop you. Both Ed and I dislike Ranch Dressing, but the powdered stuff adds a unique and interesting flavor. 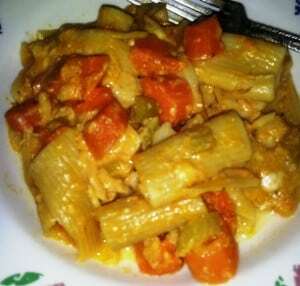 De Cecco Rigatoni – This is a hearty pasta and De Cecco is a premium brand, which holds up well in the Instant Pot and Pressure Cooker. 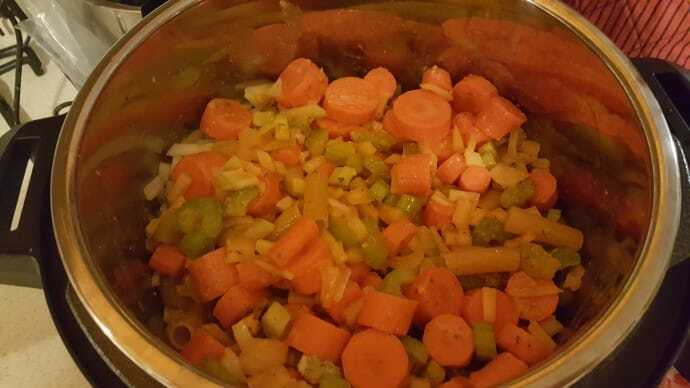 Carrots – Might as well add some veggies! Celery – Adds a natural salty flavor. Worcestershire Sauce – Really ups the flavor. 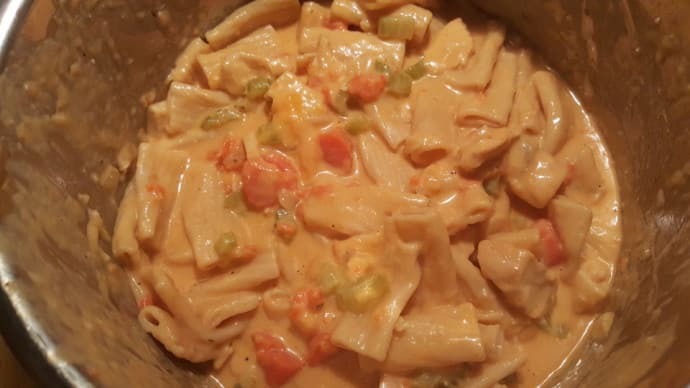 How do you Make Pressure Cooker Buffalo Chicken Macaroni & Cheese? Well, pretty much everything gets added at once! The Chicken will be removed later and chopped. Lots of Cheese will be added and melt into the Pasta and Sauce. Tips and Tricks to Instant Pot Buffalo Chicken Macaroni & Cheese? There are not many ingredients and you probably already have them all in your pantry and freezer. 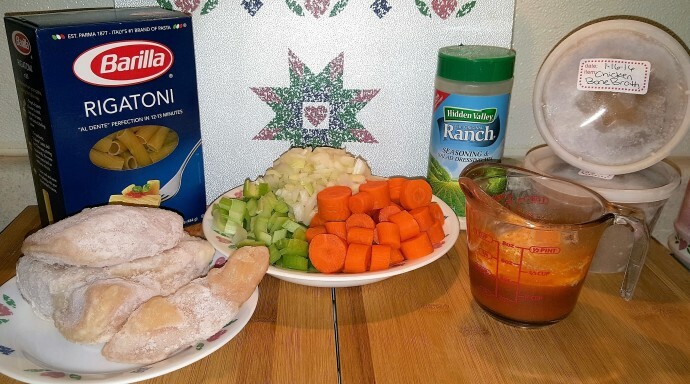 The beauty of this meal is that you can use fresh or frozen Chicken! De Cecco Rigatoni is best for using in the Instant Pot or Pressure Cooker and really, for everything. It’s more forgiving and stays al dente. I have no idea why we had Barilla in the house. I always have tons of Reditainer Extreme Freezer Containers filled with Chicken Bone Broth in my freezer and use it frozen. Don’t leave out the Hidden Valley Original Ranch DRY Seasoning, even if you despise ranch salad dressing like my husband and I both do as it really adds the key note to this dish. 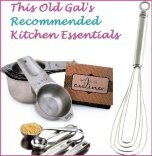 In my This Old Gal Pressure Cooker Cookbook, I show you how to make your own Dry Ranch Seasoning by scratch. 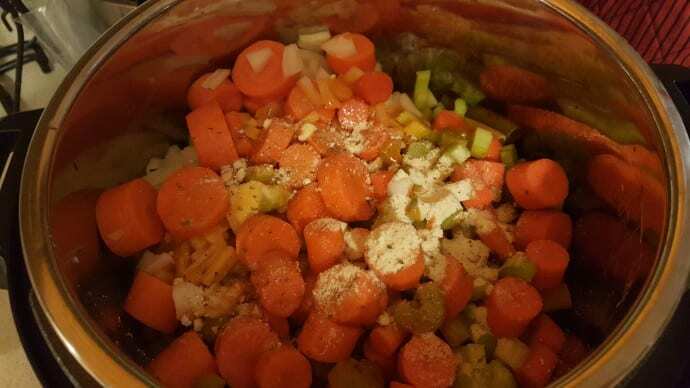 Add the chicken, pasta, stock, vegetables, Buffalo Sauce and Ranch seasoning to the Pressure Cooker cooking pot. Give it a mix and you are ready to cook. There is a lot of stuff in the Pot! While Macaroni and Cheese is not on the lower calorie side, remember, there are so many other ingredients that are healthy. If you want to use more Carrots, just add them. After the pressure is released, remove the Chicken from the Instant Pot or Pressure Cooker cooking pot and cut into pieces. 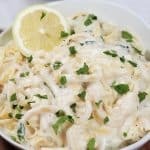 Best Cheese for Instant Pot Crack Buffalo Chicken Mac & Cheese? The Pasta will be a little firm at this point. As you add the Cheese and it melts into the Sauce and Pasta, the noodles will finish cooking. The Feta cheese add such a nice tartness to the recipe. If you cannot find Jarlsberg, try using Swiss Cheese instead. 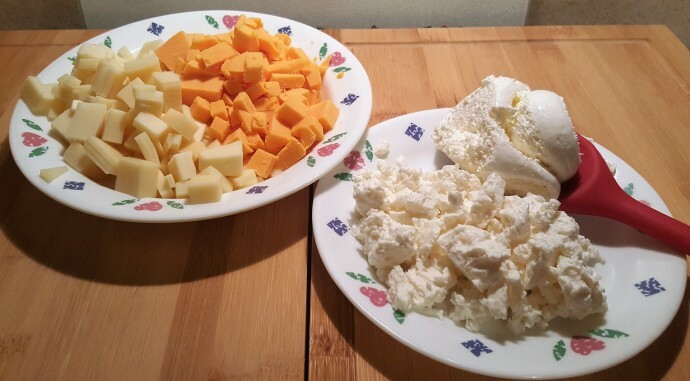 Allow each Cheese to melt before adding in the next Cheese.. The noodles will continue to cook and will be the perfect al dente texture, by the time you are ready to eat. Chop or Shred the Chicken, which ever you prefer. You might be wondering why I chop the Chicken after pressure cooking, rather than before. 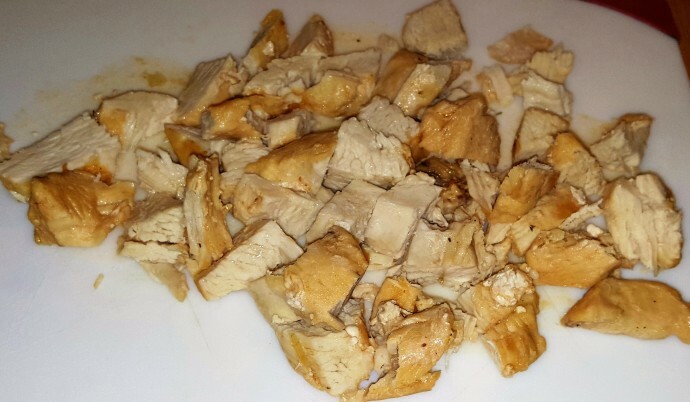 I want to keep as much juice in the chicken as possible and with the large pieces, it is less likely to over cook. The dish is nice and creamy, with a teeny kick. The Buffalo Chicken Macaroni and Cheese freezes well and is so simple to heat up in an Instant Pot or Pressure Cooker. We like to store the leftovers in 24 ounce Reditainers Extreme Freezer Containers as they are BPA free, hold up well and are perfect for two servings leftovers. Plus, they are cheap enough to share leftovers with guests. 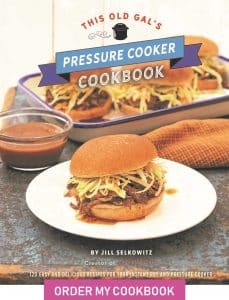 For traditional delicious other Mac & Cheese recipes, check out my Pressure Cooker Macaroni and Cheese, Fully Loaded and my Pressure Cooker Butternut Squash Pasta recipes. Lock on the lid and close the Pressure Valve. Cook at High Pressure for 5 minutes. When Beep sounds, wait 5 minutes and then release the rest of the pressure. Open the lid and remove the Chicken and chop. Gentle stir in the cream cheese, cheddar, Swiss and Feta, stirring until dissolved. Return Chicken to pot and stir. It you want the dish less spicy, just add 1/4 cup of Frank's Original Cayenne Pepper Sauce. Fresh, thawed chicken works too! 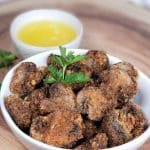 If using dark meat, cut the chicken into 2 inch chunks. PIN this Pressure Cooker Buffalo Chicken Macaroni and Cheese! Tasty! I didnt have celery so I added spinach at the end, instead. I’m not sure whether the lack of celery changed the liquid content, because the pasta on the top was a little dry, and I had to stir it and let it sit in the hot pot for another 10 minutes to soften it. I will definitely make this again, but maybe add a little more liquid. That looks sooo good. Hoping to make it soon! I made this tonight with thawed chicken tenders that I cut into pieces. 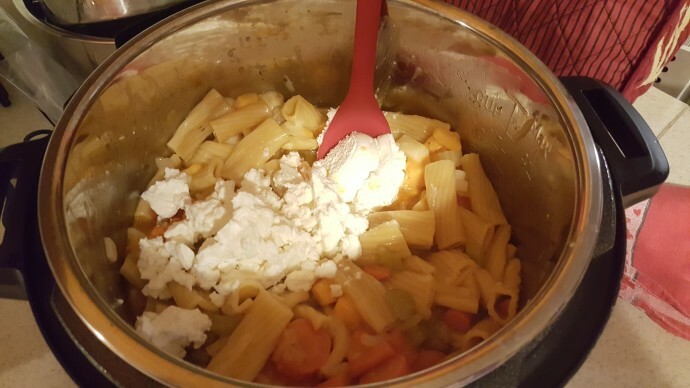 I also used Aldi’s brand GF noodles, along with feta, mild cheddar and mozzarella. All I can say is Wow!! This is so yummy! My boys and husband all had seconds. Thank you! Will definitely make again.